Do you know the term Oldie but a Goodie? That’s 15 East. 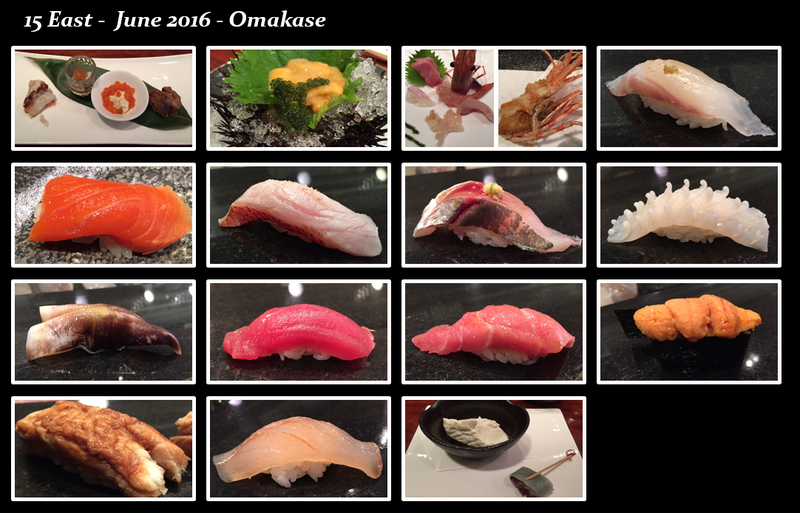 Over the last few years, a million new sushi-yas of the same category popped up, and I’ve tried them all. Ok, maybe not every single one, but most! There’s a reason why certain ones persists. I don’t remember exactly when my last visit was, but it was when Chef Masato Shimizu was still running the show. Chef Shimizu, who goes by “Chef Masa” left 15 East in the summer of 2015. He actually left our great country as a whole last summer. For his loyal fans, after you wipe your tears and dry your eyes, know that chef Shimizu returned to his wife’s native hometown in Bangkok Thailand, and has since opened up a sushi-ya there called Sushi Masoto. I read that it was wildly popular though, so make reservations WAY in advance if you’re planning a trip. The new sheriff in town is Noriyuki Taka. Has anything changed? YES! First, reservations opened up. Although a plus, isn’t that a bad sign? I was able to get a Friday night reservation just 3 weeks in advance. That was unheard of back then! Maybe I was just lucky though. Second and more importantly, the food. I can’t quite put my finger on exactly what’s changed, but it has. You still start with your several small plates, then sashimi, then sushi. The fish is still fresh, the variety is still broad, and chef is still super friendly. My only way to describe it is how I felt leaving. In the past, I would finish my meal, and think “I can’t wait to come back,” this time, I thought “I’ll definitely be back, but will try some others first.” While I say that, I also need to say that I find MOST of the newbies in this category as so-so. 15 East, though not as thrilling as it once was, is still one of my top favorites in its category. NIDAKO – If you read my USHIWAKAMARU write up, you’ll already know how I feel abt this, that it’s AWESOME! Not a huge fan of Octopus as a sushi/sashimi in general, EXCEPT if it’s from either 15 East or USHI. The NIDAKO at 15 East is poached all the way through, but still maintains incredible freshness. It is absolutely scrumptious. 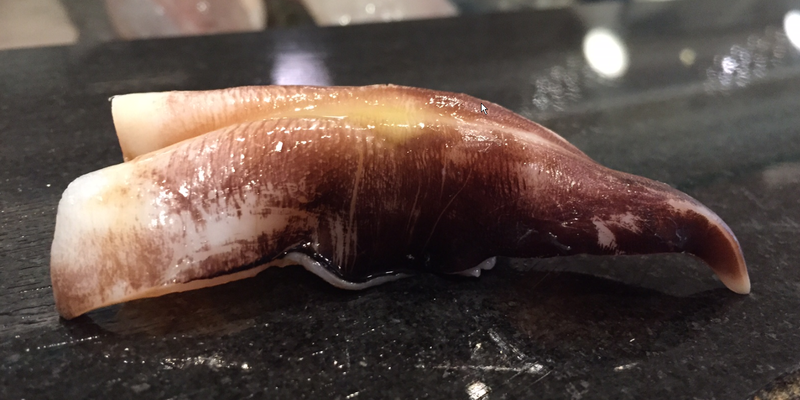 HOTATE – This was supposed to be a “baby scallop”. This was marinated and served swimming in MOMIJI OROSHI (Grated Daikon Radish marinated with red chili pepper). I wasn’t a huge fan of this. I wish I can now describe the difference between a baby or full grown scallop, but the MOMJI OROSHI completely took over the entire dish, I couldn’t taste the HOTATE at all. 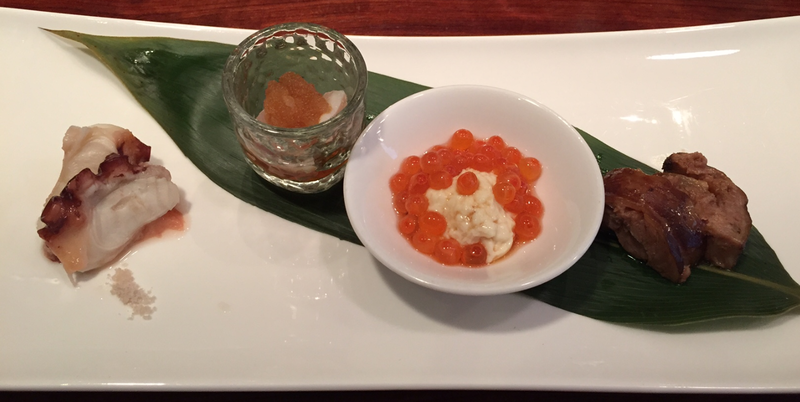 TOFU SKIN with IKURA – I’m a huge fan of bean curd, tofu, and tofu skin. But I was not a fan of THIS tofu skin. It was slimy, a bit sour, and otherwise tasteless. I don’t understand the pairing either. Why would TOFU SKIN go with IKURA? 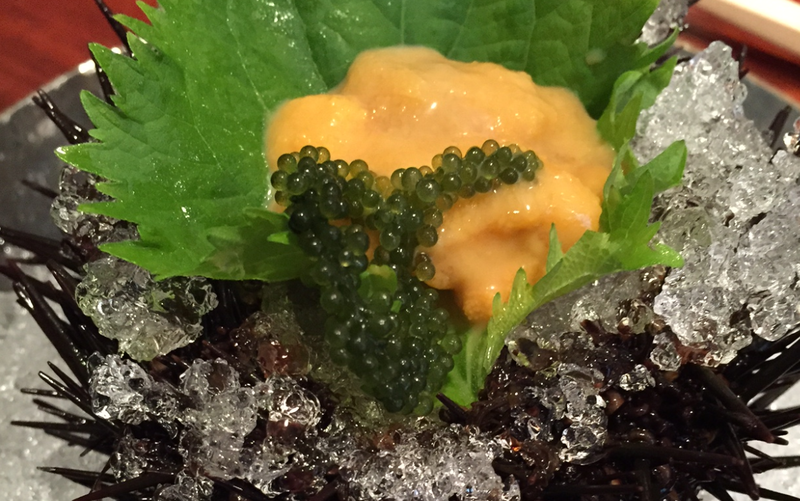 The IKURA was fab though! SIMMERED TUNA BELLY – This was tasty-ish, but nothing I would ever order. Seemed they took time and care to prepare this, I’m just not a huge fan of cooked tuna. I think this is where we can start seeing the difference between then and now. Three out of 4 that I wasn’t thrilled with. 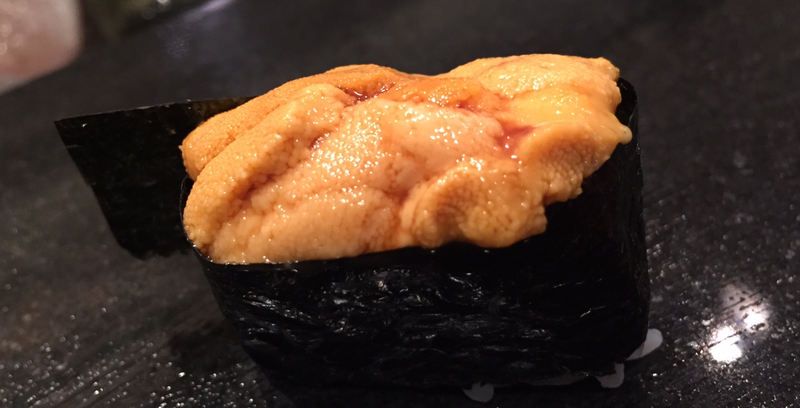 Live HOKKAIDO UNI – If not for the brightness in color, and the chef declaring it to be from HOKKAIDO, I would not have believed it. It wasn’t fantastic. The taste itself was fine, not the king of UNIs, but acceptable, but It was so watery! Each piece fell apart as I picked it up via my chopsticks. That, I did not like at all. BOTAN EBI – This was ginormous, super crunchy, and very good. I wish I had the video to demonstrate how incredibly fresh this was, this guy was going NUTS with his antenna and legs. 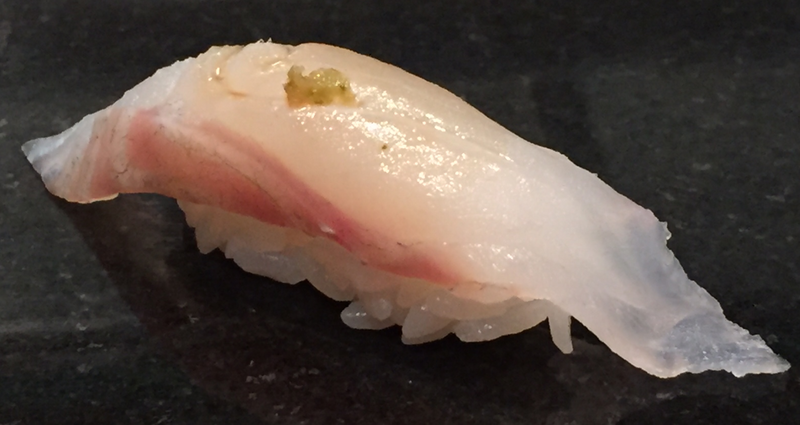 SABA – Hidden behind the head of the BOTAN EBI, you’ll find a very small piece of SABA. What’s the deal? I’ve been given SABA A LOT recently as part of my omakase. It was fresh, and I don’t dislike it, I’m just not a big fan of this fish. There’s just so many more in the silver category that’s so much more exciting! 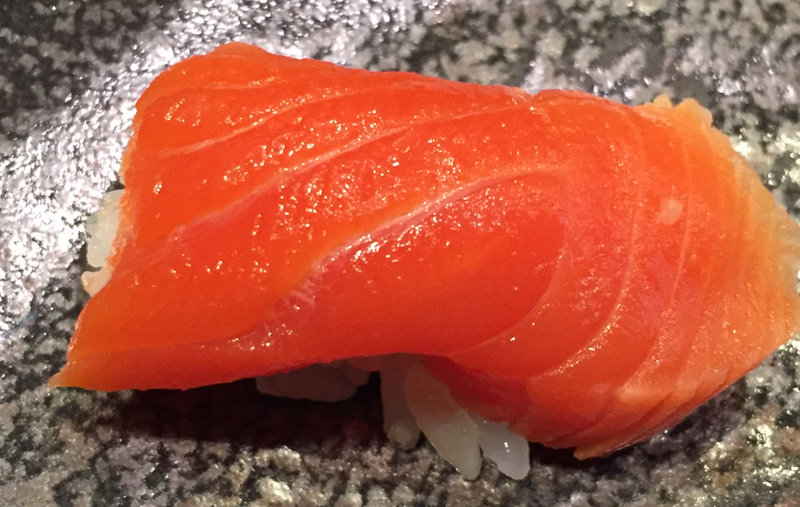 HIRAMASA – Surprisingly, I like! I’m usually not a fan of HIRAMASA, but this one was milder than usual. MIRUGAI – For some odd reason, I’ve rarely, if ever, had a bad piece of MIRUGAI. This was no exception, super fresh, crunchy, YUM! 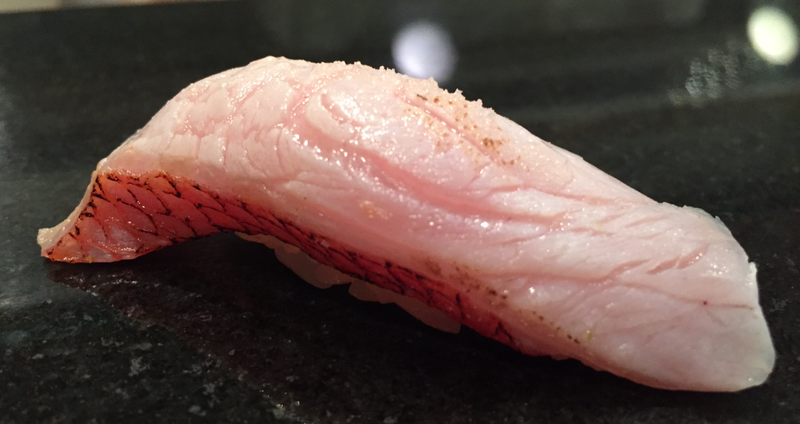 HIRAME – This guy was chewier than usual, but I’m a huge fan of most whitefishes. It was my first whitefish of the day, so I gave it a pass for the chewiness. OTORO – Chef says this is OTORO, but had he not said it, I would have guessed it to be a CHUTORO. If you read about TOROs in my sushi guide, you’ll know that I’m NOT a fan of OTORO. That every time I eat OTORO, I feel a need to wash the film of oil out of my mouth after. The difference of OTORO and CHUTORO is just where from the fish is cut from. OTORO is closer to the front of the underbelly, while CHUTORO is farther in the back. Perhaps this was the borderline? I don’t know, I don’t care. Though CHUTORO is typically cheaper, I much prefer a CHU. So I’m happy! Fried BOTAN EBI head – I forgot to take the picture immediately as it arrived. I ate the good part already! SUZUKI – Served with a tiny dollop of Yuzu topping. The fish had the tiniest chew, and was absolutely delicious! I love starting with whitefish. SAKURA-MASU – Does this piece look a little smaller? I forgot to photo again. Lucky for you, this is one of those few fishes that I don’t eat the whole of, which is what you are supposed to do! I always only take a small bite to see how good it is, and then make the boyfriend finish the rest. I do that because I am just not a huge fan of salmons, and lucky for me boyfriend is! Actually, even if he didn’t like it, he’d take anything off my plate and offer me whatever I like of his. Yes, be jealous, he’s THAT good to me! KINMEDAI – This was a fantastically fresh piece of KINMEDAI. It was lightly ABURIed, topped with a little bit of salt, and NO splash of freshly squeezed lemon juice. This was perfect. It absolutely melted. AJI – I love a good AJI. And this one was GOOD. AJI gets fishy really quickly, this one was not one bit fishy, and just absolutely delicious! I also loved that they put that bit of grated ginger, and little to no scallion. YARI IKA – YARI IKA is one of my more favorites of the IKA family. It was immensely fresh, and the way the chef prepared it, it was left with just the tiniest chew. The odd part was, we got the YARI IKA, a little later though, the patrons next to us got the SURUME-IKA. That’s a lesser IKA by far. I WIN!!! TORIGAI – It’s a pricey GAI, but I’m just not a fan. The TORIGAI in general is an incredibly mild, almost flavorless GAI. That’s just the nature of the fish, and the reason why I’m not a fan. It’s not at all chewy, which means it’s very fresh, other than that, my commenting on this fish would be skewed, so I’ll stop there. AKAMI – Always like a good AKAMI! Almost as much as a good CHUTORO! This was light, tasty, and incredibly fresh! 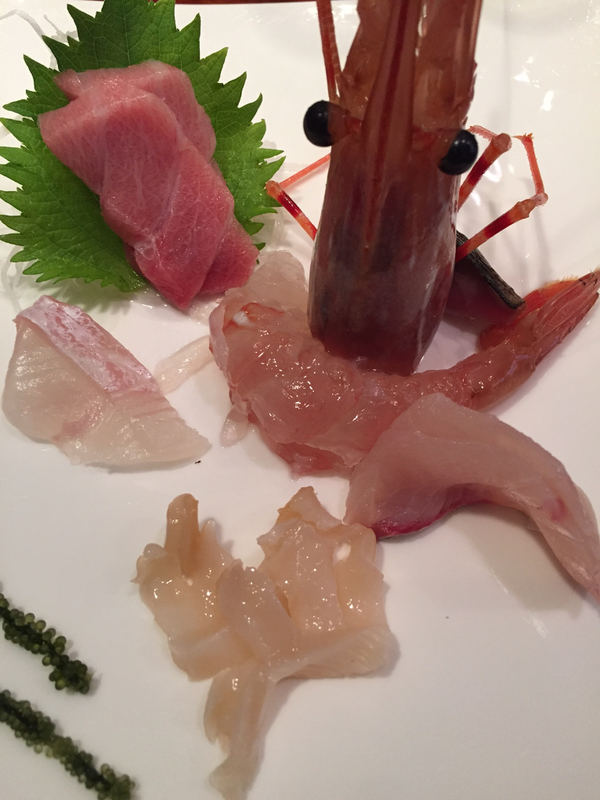 CHUTORO – Take another look at my sashimi dish. I suppose the “OTORO” on that dish is a bit fattier, but I would say they are not that different at all. This was a good cut of CHUTORO, very fresh, very good. 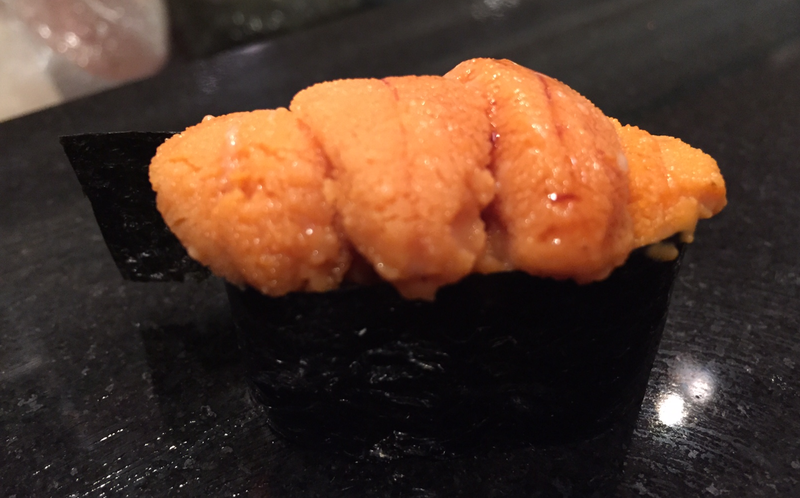 UNI from HOKKAIDO – I think chef said that it was from “NAMERO”. Not sure though. There’s way too many provinces in Hokkaido that has great UNI, no way to keep track of them! This one was VERY GOOD. Night and day when compared to the LIVE UNI. My sugar-pie LOVES LIVE UNI, especially those from California when in season, I’m honestly a bigger fan of boxed. Prime example! 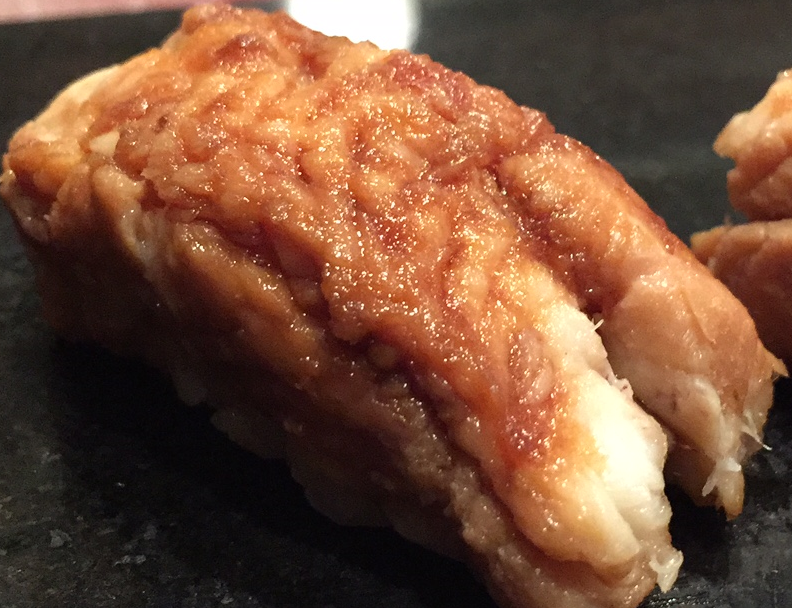 ANAGO – We were both supposed to be getting ANAGO, but as usual, I made my request at the beginning, no ANAGO for me. Chef forgot, so lucky boyfriend, he gets two! KISU – I got the KISU instead. This was served KOBUJIME style, meaning it was marinated in KOMBU, a tasty seaweed. This one was pretty salty, yet still bland. How is that possible? I’m still much happier with this than the ANAGO though! DESSERT – The bowl contained a tofu panacotta atop of some syrup. On the bottom right, is a berry mochi. 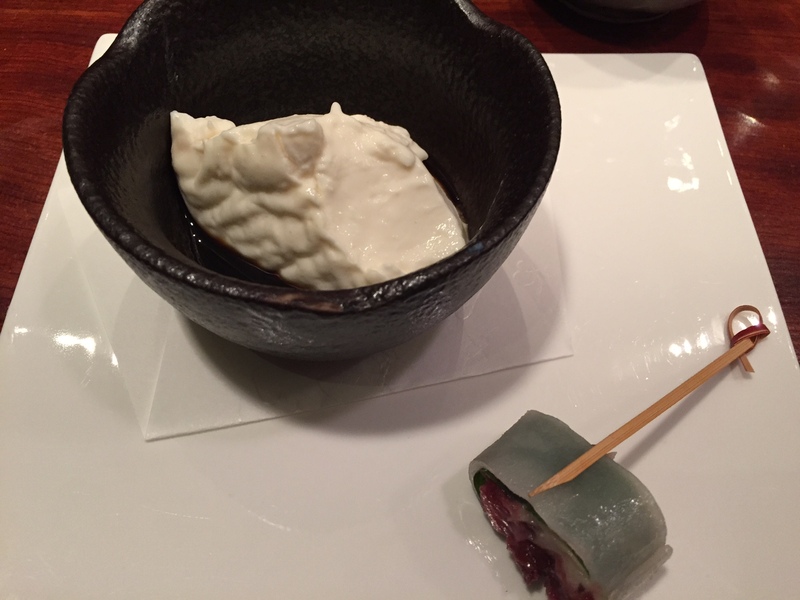 It was not like mochis in general, texture was different, taste was awful. Very sorry dessert chef, but this was downright gross, they both were! Despite our dear Chef Masa’s departure, 15 East is still one of my favorites in this category, the category of “Not-so-fancy-sushi”. 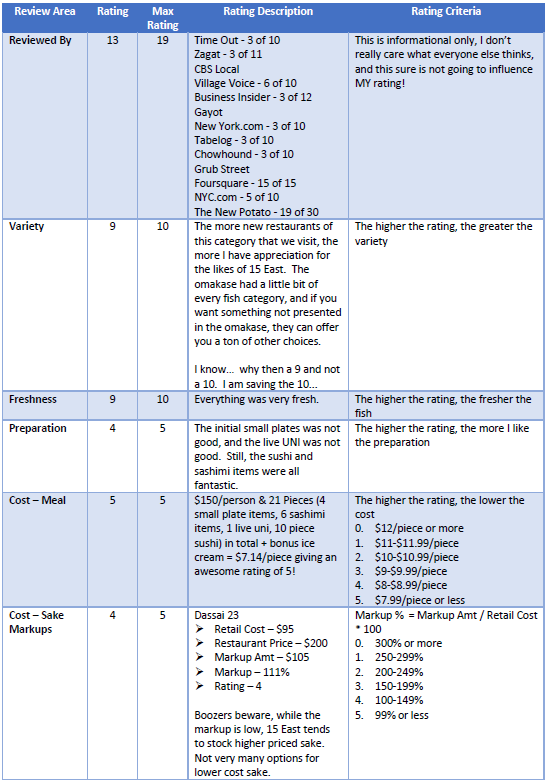 Overall great rating of 31 out 35.